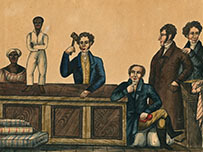 In 1808, America abolished the international slave trade, ending the export of people from the African continent to the Americas. The domestic slave trade, however—the buying and selling of slaves within the US—continued until the close of the Civil War in 1865. During those 57 years, an estimated one million people found themselves at the center of a forced migration that wrought havoc on the lives of enslaved families, as owners and traders in the Upper South sold and shipped surplus laborers to the expanding Lower South. Many of those individuals passed through New Orleans, the largest slave market in antebellum America. The exhibition Purchased Lives: New Orleans and the Domestic Slave Trade examines the individuals involved in the trade and considers New Orleans’s role in this era of US history. 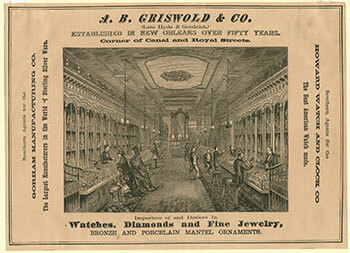 In the 19th and early 20th centuries, New Orleans was at the center of a crisscrossing network of global trade routes.The city’s retail stores were filled with goods from New York, Boston, Cincinnati, England, France, Germany, and other manufacturing centers around the world, making New Orleans a popular shopping destination. From the china and silver shops on Chartres Street, down Furniture Row on Royal Street, to the colossal luxury and department stores along Canal Street, the world’s latest fashions converged in the shops lining the city’s muddy thoroughfares. Goods of Every Description: Shopping in New Orleans, 1825–1925 invites visitors to peer into 19th- and early 20th-century shop windows and see the variety of goods available in the cosmopolitan Crescent City. Since the founding of New Orleans, women have played an active role in shaping the city. The city's tricentennial in 2018 provides an ideal opportunity for reflecting on the many women who fought for the welfare and rights of their fellow citizens and the preservation of the city’s rich heritage. The exhibition Voices of Progress: Twenty Women Who Changed New Orleans presents the stories of twenty remarkable women whose contributions range from the nineteenth-century campaign for child welfare, through the early twentieth-century suffrage movement, to the mid-twentieth-century fight for civil rights and equality. 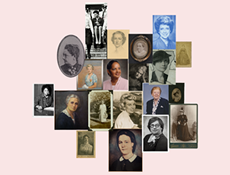 Through letters, objects, photographs, film, and more, Voices of Progress spotlights the achievements of these extraordinary women in New Orleans history.